Location of Beypazarı, Ankara within Turkey. Beypazarı is a Turkish town and district of Ankara Province in the Central Anatolia region of Turkey, approximately 100 km west of the city of Ankara. According to the 2000 census, the population of the district is 46,493, of which 35,775 live in the town of Beypazarı. The district covers an area of 1,814 km2 (700 sq mi), and the average elevation in the center is 675 m (2,215 ft). The district contains three other small towns (Karaşar, Uruş, Kırbaşı) and 64 villages. It used to be an important city in Asia Minor in ancient times. The name Beypazarı means The Bey's market in Turkish, as in the Ottoman period this was an important military base and the cavalry stationed here were an important element of the local economy. The area has a long history of occupation by Hittites, Phrygians, Ancient Romans, Byzantines, Seljuk Turks and the Ottoman Empire. Like most Luwian cities located in West Anatolia, Lagania supported the Trojans during the famous Trojan war. Beypazarı was known as Lagania (Greek: Λαγάνια), meaning rocky peak in the Luwian language during the Roman and Byzantine times, and the town was a regional administrative center. Lagania belonged to the region of Galatia, which was occupied early in the 3rd century BC by Celtic tribes. The Gallic region was later (189 B.C.) subjected by the Romans. It became a Roman province in 25 BC, and was split into two provinces, Galatia Prima and Galatia Secunda, in the 390s. Lagania was in the province of Galatia Prima, and received the name of Anastasiopolis (Ἀναστασιοῡπολις) during the reign of Emperor Anastasius I (r. 491-518– ) after he had visited the city and liked it so much. 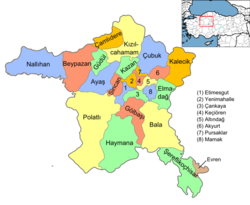 The town was also an episcopal see, suffragan of the Metropolis of Ancyra (modern Ankara), mentioned by the Notitiae Episcopatuum up to the 12th and 13th centuries. The town was conquered by the Seljuk Turks in the 12th century and was settled by various lords of the Oghuz Turks, eventually becoming part of the Ottoman Empire. Gazi Gündüzalp, the grandfather of Osman I, the founder of the Ottoman Empire, is buried in the village of Hırkatepe in the district. Traditional Turkish handicrafts continue to be used in Beypazarı. Beypazarı today is a small town in a rural district famous for its carrots, (producing nearly 60% of Turkey's carrots), silverwork (Telkari), and a high quality natural mineral water. The crystal mineral trona, a kind of natural soda used in glass-making is extracted in Beypazarı. With its rich history, architectural heritage and attractive rocky countryside Beypazarı is becoming increasingly attractive to visitors, especially day-trippers from Ankara. The cobbled streets of white Ottoman period buildings are particularly attractive; many of the old houses have been restored as hotels and restaurants (and are also popular with Turkish film directors looking for authentic locations. Every June the town holds its popular Traditional Historical Houses, Handicrafts, Carrot and stew Festival. The visitors of course are bringing valuable income to the town, shopping for silverware and providing good custom for the food markets and restaurants. 80-layer baklava (which is usually 40- layer), a speciality of Beypazarı. For many visitors a major attraction is the cuisine, which includes typical Turkish dishes such as the yoghurt drink ayran, cracked wheat (or flour), yoghurt, and vegetables fermented then dried and mixed with water to make a thick soup tarhana, stuffed vine leaves, home-made sausage mumbar, and a stew cooked in a stone-oven called güveç. Sweets include the sweet cream pudding called höşmerim and pastries including a dry buttery biscuit called Beypazarı kurusu, and a renowned 80-layer baklava. They are also very inventive with their carrots, drinking carrot juice and producing carrot-flavoured Turkish Delight and carrot ice-cream. Beypazarı is surrounded by good farmland and the fresh ingredients are a large part of why Beypazarı's cooking is so popular with visitors. One of the best-known eateries is the restored Ottoman house, the Taş Mektep restaurant. A popular gift to take back home is the sticky sausage-shaped sweet made from dried molasses-like grape syrup stuffed with walnut cevizli sucuk. The town is unusual in Turkey for celebrating a religious festival (Regaip Kandili, the conception of the prophet Muhammad) with lights and fireworks. Beypazarı is a member of the European Association of Historic Towns and Regions (EAHTR). Beypazarı as viewed from the top of Hıdırlık Hill. ^ GeoHive. "Statistical information on Turkey's administrative units". Retrieved 2008-03-28. ^ Statoids. "Statistical information on districts of Turkey". Retrieved 2008-05-04. ^ European Association of Historic Towns and Regions. "Historic Towns of Turkey". Archived from the original (DOC) on 2008-09-10. Retrieved 2008-03-28. Falling Rain Genomics, Inc. "Geographical information on Beypazarı, Turkey". Retrieved 2008-03-28. Municipality of Beypazarı, Turkey. "History of Beypazarı, Ankara". Archived from the original on 2003-05-03. Retrieved 2008-03-28. Municipality of Beypazarı, Turkey. "Physical structure of Beypazarı, Ankara" (in Turkish). Archived from the original on 2002-09-11. Retrieved 2008-03-28. Wikimedia Commons has media related to Beypazarı. This page was last edited on 7 March 2019, at 21:08 (UTC).